Introducing Masonic Square, a small community of single-level townhomes that runs along the banks of the Minnesota River. Our assisted living apartments provide those with changing healthcare needs both privacy and peace of mind. Residents who require ongoing medical attention and skilled nursing care are welcome to enjoy the personalized attention and services of our Home. Whether you are healing from orthopedic or cardiac events, or require rehabilitation for stroke or surgery, our Transitional Care Unit is one of Minnesota’s best. Our team of over 100 physical, occupational, speech and massage therapists provide comprehensive services in one of our five therapy gyms on campus. Minnesota Masonic Home has provided compassionate, exceptional care for nearly a century. Since the arrival of the first resident in 1920, Minnesota Masonic Home has provided comfort and care to older adults in an idyllic setting on the banks of the Minnesota River. Designed as a place of comfort and peace for Members of the Masonic Fraternity and their families, the Home is now a full continuum of care campus open to all who seek the highest quality of life for themselves and their loved ones. Minnesota Masonic Home's mission is to provide compassionate, quality care and services to aging adults, guided by the principles of our Masonic founders and informed by best practices in healthcare and the collective experience of nearly a century of service. 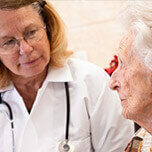 Our evidence-based, resident-centered care is made possible through our five-star team of compassionate professionals. Find out if you are ready to make the "Masonic Difference." We depend on the generous spirits of our volunteers! Help us improve the lives of those we serve.